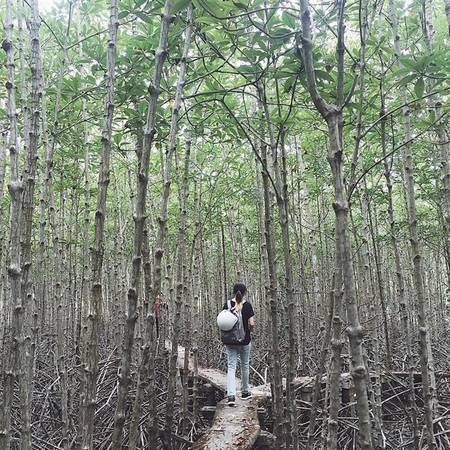 The major habitat types found at Can Gio are plantation mangrove, of which there is about 20,000 ha, and naturally regenerating mangrove, of which there is about 7,000 ha. The principal mangrove species used for replantation has been Rhizophora apiculata, although R. mucronata has also been used in smaller amounts. In addition to the mangroves, the site also supports seagrass beds dominated by Halophyla sp., Halodule sp. and Thalassia sp. The intertidal mudflats and sandbanks at the biosphere reserve are an important habitat for migratory shorebirds. ADB (1999) reports that Wood Sandpiper Tringa glareola, Common Redshank T. totanus, Common Sandpiper Actitis hypoleucos, Grey Plover Pluvialis squatarola, Lesser Sand Plover Charadrius mongolus and Black-winged Stilt Himantopus himantopus occur at the site. In addition, several globally threatened and near-threatened waterbird species have been recorded at the IBA, including Spotted Greenshank Tringa guttifer, Asian Dowitcher Limnodromus semipalmatus, Spot-billed Pelican Pelecanus philippensis and Painted Stork Mycteria leucocephala. Consequently, Can Gio qualifies as an Important Bird Area.